The Eagles appear to be in a state of turmoil. They have lost three straight games and easily could be 0-7 at this point in the season. The offense has struggled with ball security so, naturally, they fire their defensive coordinator during the bye week. Yesterday, new defensive coordinator Todd Bowles’ defense was atrocious as the Atlanta Falcons were able to do whatever they wanted on the field. Everyone has seemingly had it with the play of this team and wants a mix up. Well fans might get their wish as 94WIP’s Howard Eskin is reporting that rookie QB Nick Foles, not Michael Vick, will start next Monday night against the New Orleans Saints on Monday Night Football. #eagles Andy Reid met with coaches after game on sunday to discuss QB situation. Meet again Mon Morn. I'm told likely QB change to Foles. There are plenty of concerns about starting a rookie quarterback on Monday Night Football in front of the entire country and especially for his safety behind the Eagles’ porous offensive line. It looks like fans will finally get to see what the kid has on Monday. 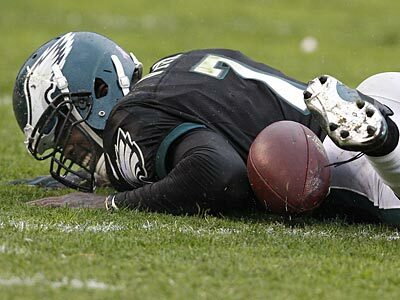 I'm told by somebody who would know that Vick has not been benched for Nick Foles. As of now, he remains Eagles' starting quarterback. This tweet from Reuben Frank debunks the report earlier from Howard Eskin. What Howard jumped the gun on a major news story that may not be true? Nah. Not him.